In the real world, the funerals continue for victims of the Florida school shooting. In the virtual world, the survivors are the subject of relentless attacks. Yes, attacks. People on social media are sharing smears and conspiracy theories about the shooting and the survivors. Some of the attacks are designed to discredit the student activists and dismiss their calls for gun law reform. Criticism of policy positions is one thing. But lies and hoaxes are another thing altogether. These lies are like a form of pollution, poisoning our media environment and making us all sick. 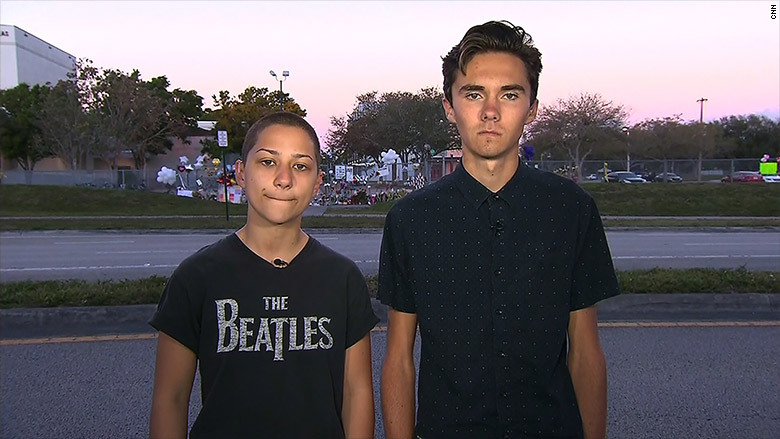 Case in point: The claims that student activist David Hogg is a "crisis actor," paid to pretend that he was a Parkland survivor so that he could lobby for gun control. He felt compelled to publicly deny this in an interview on CNN Tuesday night. He expressed sympathy for the alienated people who spread this stuff. "I'm just so sorry that these people have lost their faith in America," he said. This misinformation pollution comes from extremist bloggers and trolls, many of whom are anonymous, and some of whom don't even believe what they're saying. They write blog entries, make sharable graphics and post YouTube videos to confuse and scare people. I see it happen all the time, especially in the wake of tragedies. They promote alternative realities about "false flag operations" and "deep state conspiracies." Some of them believe this stuff; some prey on people to gain traffic and score political points. Some of this week's memes and videos allege that the Parkland students are just props for a globalist plot to take away peoples' guns. This is a variation on "fake news," which is stories that are made up and designed to deceive people for propaganda or profit. So what can the rest of us do about it? That's the question I'm struggling to answer. One common response: "Ignore the crazies." Another response along the same lines is, "Don't give them any oxygen." The impulse is understandable. Reporting on disinformation, even just to debunk it, risks helping it reach "a larger audience that it wouldn't otherwise reach," Dartmouth College professor of government Brendan Nyhan told me. Nyhan has studied something called the "backfire effect," which posits that correcting false information sometimes causes people to believe it even more strongly. This relates to larger societal trends about distrust of the media and other institutions, which have been inflamed by politicians and bloviators. These trends are particularly pronounced among conservatives in the United States. But let's stay focused on this specific form of pollution -- conspiracy theories and smears of the Parkland students. Ignoring it helps stop the pollution from getting any worse. But it does nothing to reduce the overall level of pollution and clean up the environment. See what I mean? If there's a pollution problem — and let's be clear, there is — then many different segments of society have a role to play. Pollution can't be eliminated, but it can be reduced. Politicians can provide leadership. Senator Marco Rubio did this by denouncing the lies about his constituents on Tuesday evening. He tweeted, "Claiming some of the students on tv after #Parkland are actors is the work of a disgusting group of idiots with no sense of decency." This feels awkward to say, but the subjects of these smears also have a role to play. The high schoolers in Parkland are "digital natives" -- they have grown up with smartphones and social media -- so when they hear adults telling them to "shut up," or worse, they have a myriad of ways to respond. And that's what they are doing, responding in powerful ways through TV interviews, viral posts and marches to the state capitol. Tech companies like Facebook and Google can either make these problems better or worse, since the misinformation (and the corrections) are spread on their platforms. Newsrooms can help, too, by fact-checking and debunking the smears in the first place. I wonder if journalists should be much more proactive about disproving lies when they first emerge, rather than waiting until the lies are trending on the web. That way, when someone wields a link as a weapon in an argument -- "this blog post says the gunman was really a Democrat!" — someone else can send back a link to accurate information. "It's easy to feel hopeless because the fringe won't listen. And it's true -- the fringe won't listen," Nyhan said. "But there are a lot more people who are vulnerable to conspiracy theories, but don't necessary believe them." So should newsrooms do more to help those people? When I raised these questions in the latest "Reliable Sources" newsletter, I heard from readers who said it feels like their own family members have been "radicalized" by extremist websites, sickened by the pollution. Some readers strongly warned against "feeding the trolls," while others said they are hungry for more fact-checking of the trolls. A reader named Katy, for example, said, "I saw the fake news about the Parkland kids several times yesterday on Twitter -- but it took some searching to find the truth. We need to amplify the real news." I heard from quite a few journalists as well. Dan McGowan, a reporter at WPRI in Providence, recommended engaging in the comments sections on stories and social media. "I really think reporters and thought leaders need to take more time to tell people why the information they are posting is inaccurate in a way that isn't insulting," McGowan said. "Rather than rolling our eyes when a friend posts something that is completely false, why not take an extra second to say, 'Hey, are you sure that is accurate? That's CNM.com, not CNN.com.'" These conversations almost always lead back to the role of the tech giants. On Wednesday morning, for instance, a video promoting a conspiracy theory about Hogg was listed as the top trending video on YouTube. The company took action when observers spoke up about the problem. It blamed an algorithm and said the video has been removed. But by then, it had already been viewed hundreds of thousands of times. And the notion that a giant corporation took down the video plays right into the hands of conspiracy-mongers who say they're being censored. These are incredibly thorny problems. The tech giants are loathe to act like editors. But shouldn't they make sure the facts are more visible than the fictions? Bottom line: The pollution is getting more and more oppressive. Nyhan said that's due in part to politicians — from President Trump on down — who give cover to conspiratorial thinking. "The boundary between the mainstream and the fringe has weakened, and we're seeing more of these theories seeming to cross over via websites that straddle that line, and national and local politicians," he said. Many experts fear that so-called "fake news" is going to become more and more potent as audio and video manipulation tools get in the hands of hoaxsters. The result will be even more pollution — unless there are concerted efforts to clean up the environment.